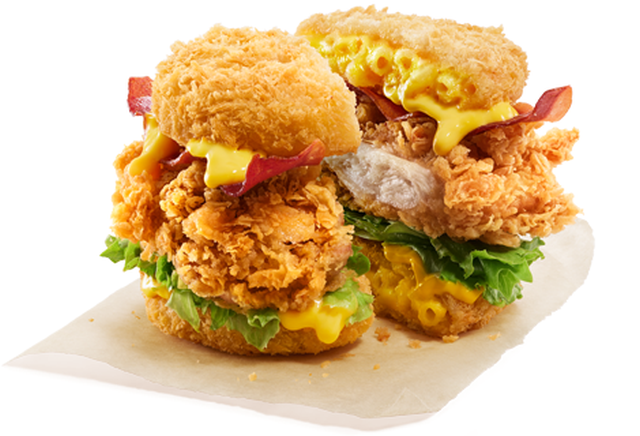 Picking up on a trend, KFC introduces new mac-and-cheese buns to the menu with the debut of the new Mac 'n Cheese Zinger in Singapore. The new chicken sandwich features mac-and-cheese molded into a rough patty shaped that are breaded and then deep-fried until crispy. Along with the two mac-and-cheese buns, you'll find a crispy Zinger chicken filet, turkey bacon, lettuce, and cheese sauce. Between the mac-and-cheese buns and the crispy chicken filet, there looks to be a lot of crunchiness to the whole sandwich.